I stumbled across this book while on Goodreads. If you love books and haven't joined that sight yet - do it! What a great place to interact with other readers, see what they're reading, and discover new books. What drew me to The Merchant's Daughter is simple, one line by a reviewer: "This book is a retelling of the classic fairy tale, Beauty and the Beast." That got me, hook line and sinker. I absolutely love that story. 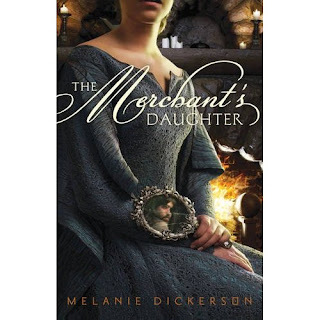 And Merchant's Daughter did not disappoint. Set in the late 1300's, I loved the glimpse into this time period. I loved Annabel's heart to learn more about God and how God met her each time she sought Him out. And I loved how she see's past Lord Ranulf's scars to the heart of him, because beauty truly is all about our hearts. At times I believe the story could have delved deeper into these characters and even into the relationship as it developed between Lord Ranulf and Annabel, but the story was a very sweet one and I closed the book with a smile on my face. This is on my TBR pile! That's the hook that got me too!!! Glad you enjoyed this one, Susan. Great review! This books sounds good, my youngest daughter at 18 has been looking for good Christian fiction to read.